Plasma membrane is the biological membrane which is present in both prokaryotic and eukaryotic cells. It is called as cell membrane since it acts as a barrier between the outer and inner surface of a cell. Plasma membrane is present in the outer most layer of the cell in animal cells and it is present beneath the cell wall in plant cells. Biologists define plasma membrane as an outer membrane of the cell and it is composed of two layers of phospholipids and is embedded with proteins. Being a thin semi membrane layer, it surrounds cytoplasm and the other components of the cell. There are different models to explain the structure and composition of plasma membrane. In 1972, fluid mosaic model was proposed by Jonathan Singer and Garth Nicolson and it has been the most accepted model now. Cell membrane (plasma membrane) is made of two layers of phospholipids. It has many proteins embedded in it. The fundamental structure of plasma membrane is phospholipid bilayer. It forms a stable barrier between two aqueous compartments. Plasma membrane regulates the entry and exit of cell. 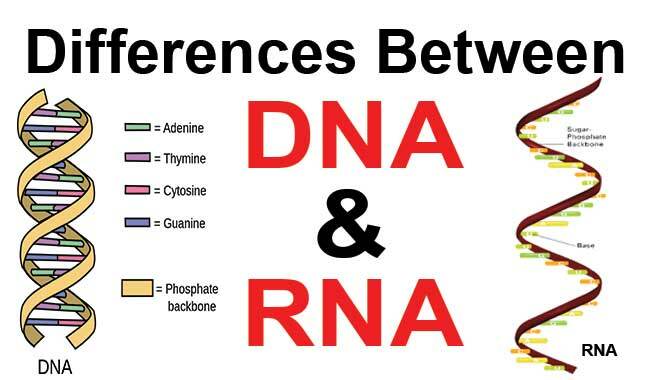 It regulates the molecular traffic in the cell. Many molecules cross the cell membrane by osmosis and diffusion. The proteins which are present in the plasma membrane act as pumps, receptors, channels, enzymes or structural components. 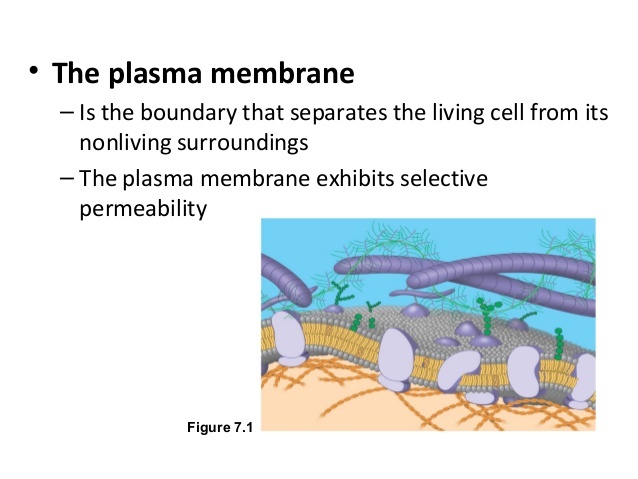 Plasma membrane is the boundary which separates the living cell from its nonliving surroundings. Plasma membrane is phospholipids bilayer. It is an amphipathic with hydrophilic heads and hydrophobic tails. 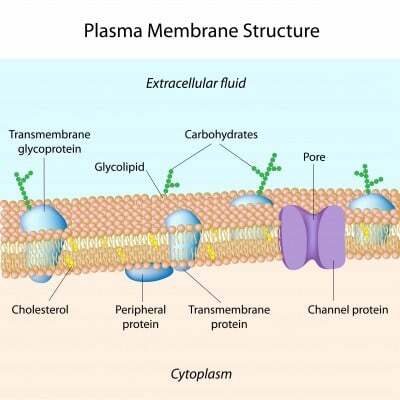 Plasma membrane is a fluid mosaic containing lipids, proteins and carbohydrate. The lipid bilayer contains two layers of phospholipids-phosphate head is polar (water loving), fatty acid tails are non-polar (water fearing) and the proteins are embedded in the membrane. Proteins like glycoprotein that are useful for cell recognition and they act as antigens and receptors. Proteins like glycolipids which are attached to phospholipids along with the sugar chains. Lipids with short chain of carbohydrates which are attached on the extracellular side of the membrane. Phospholipid bilayer which is made of phosphates and lipids. They form a partially permeable membrane which allows certain substances to diffuse through the membrane. Cholesterol is a component in plasma membrane and it maintains the fluidity of cell surface membrane. 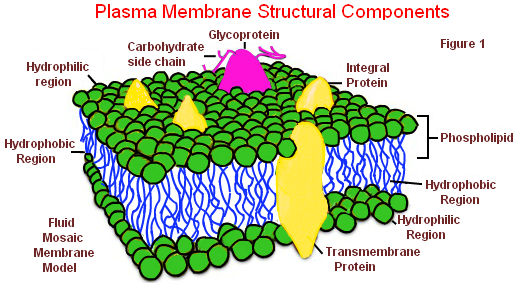 Plasma membrane separates the components of the cell from its outside environment. It regulates what enters and exits the cell. It allows only selected substances into the cell and keeps others out. Plasma membrane has a major role in protecting the integrity of the interior of the cell. Plasma membrane serves as a base of attachment for the cytoskeleton in some organisms and cell walls in other organisms. Thus it supports the cell and helps in maintaining the shape of the cell. 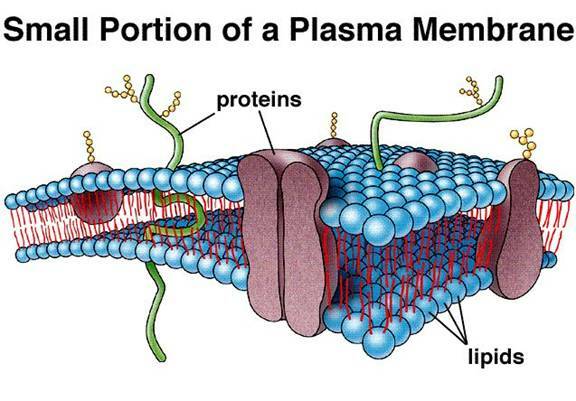 Plasma membrane is composed of lipids and proteins. Lipids give flexibility to membranes and proteins maintain the chemical climate of the cell and help in transfer of molecules across the membrane. The lipid bi layer is semi permeable, that is, it allows selected molecules to diffuse across the membrane. Prokaryotic plasma membranes have phospholipids bilayer with proteins embedded in it.They can have multiple plasma membranes. They take charge of the exit and entry of the cell. Eukaryotic plasma membrane is a fluid phospholipid bilayer embedded with proteins and glycoprotein. It also contains sterols which makes the membrane less permeable, adds the rigidity to membrane and stabilizes the membrane. Learning the function of plasma membrane with online Biology tutor is the way to understand the topic in depth and score well in such topics in Biology. For more intriguing topics in Biology, seek one on one sessions and get unique insights in the subject. 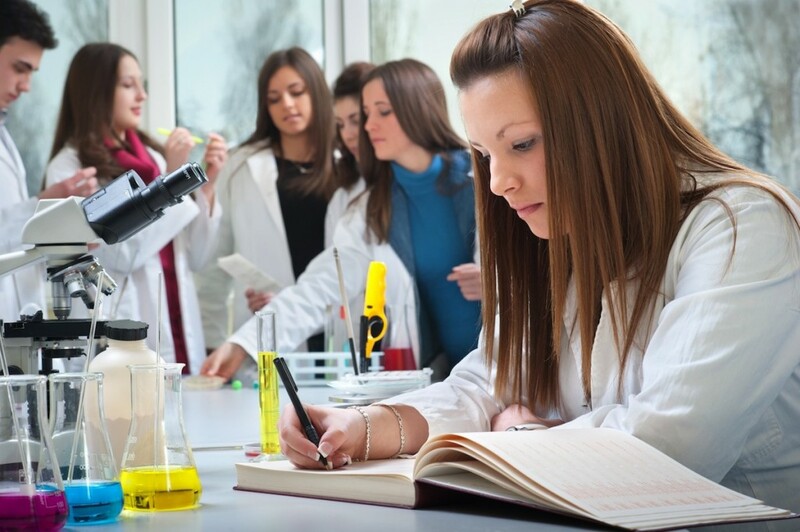 For easy homework solutions in Biology, get Biology homework help and attain mounting scores in the subject.